These glass beads are of the kind known as ‘trade’, ‘aggry’ or, sometimes, ‘slave’ beads. They are usually associated with West Africa but were originally created in Europe, particularly Venice, Bohemia and the Netherlands. The history of trade beads dates to the 15th century when Portuguese trading ships arrived on the coast of West Africa to exploit its many resources, including gold, slaves, ivory and palm oil. At that time, glass beads were a major part of the currency exchanged for people and products. 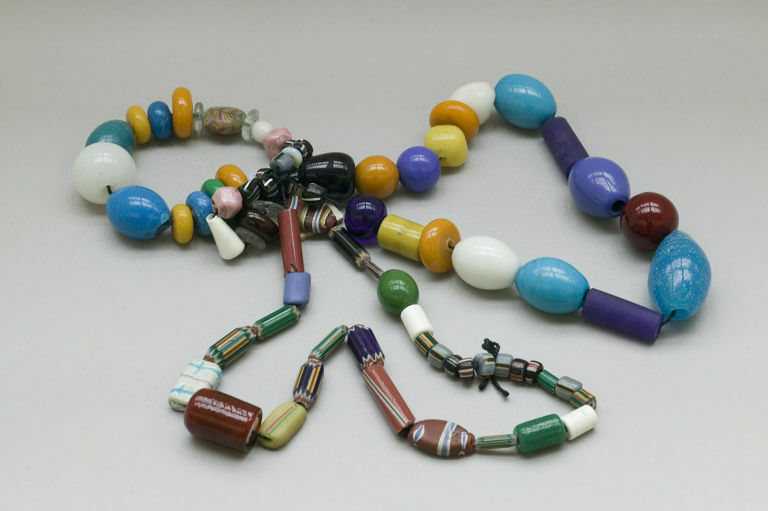 The beads traded were not of a set form, but were produced according to demand, which could vary from region to region, resulting in many thousands of different designs, as apparent here. The cost of producing the beads declined as glassmaking technologies developed and, for Europeans, the beads provided a cheap and efficient means of exploiting African resources. The numbers of people involved in trading beads for goods, the diversity of bead design and the fact that European glassmakers – and their designs – moved around makes it difficult to link a bead to a specific time and place. Some beads can be given a more precise provenance through dated sample cards, sample books and bead catalogues produced by European bead trading houses in the mid-19th to early 20th centuries, now held in museum collections. 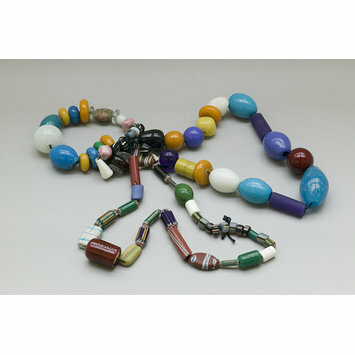 These beads were given to the Museum of Practical Geology, located at Jermyn Street, London. The Museum was established in 1835 to illustrate 'the mineral wealth of the United Kingdom and [its] colonies' and contained examples of industrial and artistic products made from raw materials mined from the earth. Its displays included glass and ceramic ware. Some of the collections were transferred to the Victoria and Albert Museum in 1901. Accessions register entry suggests the beads were 'exported from Bristol for the West African slave and gold trades'. These glass beads are of the kind known as 'trade', 'aggry' or, sometimes, 'slave' beads. Made in Europe for use in trade in West Africa, they were given to the Museum by Moses Lewin Levin, a London bead merchant. The beads were produced according to demand, which could vary from region to region, resulting in many thousands of different designs.